Along with warmer weather and blooming flowers, springtime tends to send the ants marching into your home. The scourge of many a parent to a four legged baby, the ants love to seek out your cat’s food and spend the next several months wreaking havoc, and preventing your cat from enjoying their food. While there are several different kinds of ant sprays you can purchase to take care of the ant problem, they can be harmful to your animals because they can leave a toxic residue wherever you spray it. 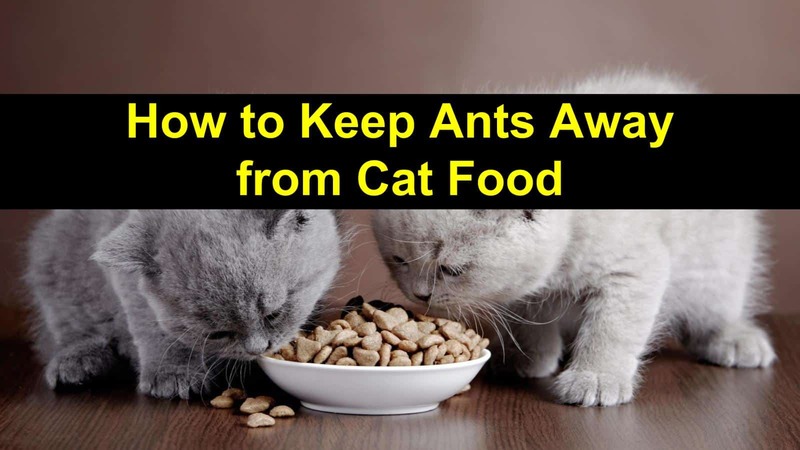 Here are several ways for how to keep ants away from cat food naturally. Ants can become a real problem when it comes to feeding your furry friend. If left unchecked, they will steal the food and prevent them from being able to eat. Here are several ways you can keep ants away from food sources within your house without resorting to using toxic ant sprays. Your first line of defense for how to keep ants away from dog food and cat food is to store the food in airtight plastic containers. Avoid keeping your furry friend’s cat food in the bag, as this makes it easier for the ants to invade. There are numerous kinds of plastic containers that you can purchase that are designed specifically for storing pet food. There are certain substances that ants won’t cross over. To keep ants out of pet food, create a barrier around the food with these substances. Ants can’t stand how these substances feel on their feet. Take any of these items and create a circle around your cat’s food bowl to help keep ants from finding their way to your cat’s food. You can purchase food-grade diatomaceous earth from your local hardware store like Home Depot or online. Ants find their way into your home because they are attracted to the crumbs and food that are left behind after your cat has eaten. One of the easiest ways to keep ants out of dog food bowl is to wash their dishes regularly. Using a safe pet detergent, thoroughly clean their dishes every couple of days. Be sure to rinse the bowl thoroughly with fresh, clean water to ensure you remove all the soap residue from the bowl. To deter ants from becoming interested in your cat’s food, keep the feeding area clean. Make sure you sweep up crumbs and leftover food after your cat has finished eating. Mopping the floor with lemon juice or vinegar mixtures will help to dissuade ants from finding the food. Removing the bowl from the floor when your cat isn’t eating is also an excellent way to keep ants from getting into your cat’s food. Note: The smell of these oils will keep the ants away from any cat or dog food. Wiping down the area around your cat’s bowl with an essential oil will keep the ants, particularly carpenter ants, away because they can’t stand the strong smell, plus essential oils don’t contain harsh chemicals making it safe to use around pets. Ants aren’t able to swim and will quickly drown in water. By building a moat around your cat’s food bowl, you will be able to deter the ants because they won’t be able to cross the water. To create a moat, you can use a cheap, aluminum baking dish that you can purchase at any grocery store. Just place your cat’s bowl in the middle of the dish and fill the baking dish with enough water to surround the food dish. Once ants have found their way into your house, they will invade any area of your home where there is food, not just your cat’s food. To deter ants from coming into your home and invading your kitchen, you can place a couple of drops of peppermint oil on several cotton balls and place them strategically around your house where ants tend to enter. If you don’t love the notion of having a bunch of cotton balls lying around your house, you can always wipe down entry ways with peppermint oil, including doorways and windows. If ants have already found their way into your home, you can use this homemade ant killer spray to eliminate ants that have already taken up residence in your kitchen. There are more ways if you ever wondered how to get rid of ants. Lemon, orange, and clove oils are all toxic to ants so when they are sprayed directly with a mixture of all three; they die immediately. This homemade ant killer recipe is great because the ants will take the toxic mixture back to their colony and feed it to the rest of the ant colony. If you have small children or pets in your home, use this method with caution. Mix the ingredients in a microwaveable jar. Place the jar in the microwave and microwave the contents until warm. About 30 seconds, remove the jar and shake until the boric acid and sugar have dissolved. Soak cotton balls in the mixture. Place the cotton balls on a sheet of wax paper. Place the wax paper in areas where you have detected scout ants. Finding ants in your cat food bowl is never a fun discovery. With the suggestions listed above, you should be able to keep the ants away from your cat’s food and out of your kitchen. Keeping ants out of cat food will also ensure you don’t end up with a pesky ant infestation in other areas of your home. 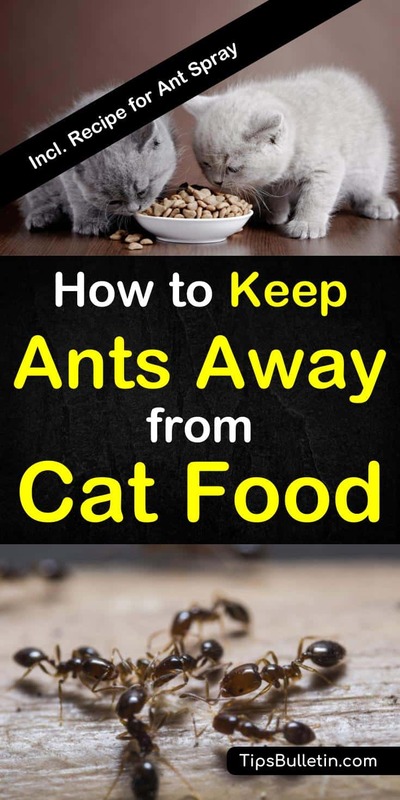 We hope you find these simple solutions helpful and find success in keeping ants out of your cats food bowl and kitchen. If you enjoyed this article and know someone who could benefit from the information provided, please share this article with them.